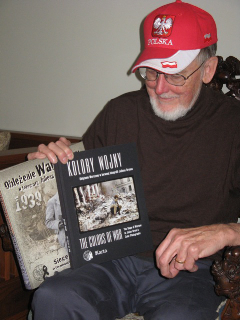 During the summer of 2013 he hosted two teams of researchers from Poland’s Institute of Nation Memories, and collaborated on the digitization of thousands of b+w still photos from the Soviet Union in the 1930s. A publication is planned “Poland Between the Wars; Between Two Totalitarianisms” for late 2014. It would join their two previously published books that he worked on. Also, during the summer and fall of 2013, he consulted with and provided still and motion picture material to a German TV station which produced a documentary, “The Teacher Who Defied Hitler.” He even became a talking head on the program, aired in the U.S. on Smithsonian Cable in November. Finally, he and his wife have accepted an invitation from a new World War Two museum in Gdansk to attend its opening September 1, 2014 and participate in the ceremonies commemorating the 75th anniversary of the start of the war, September first 1939.